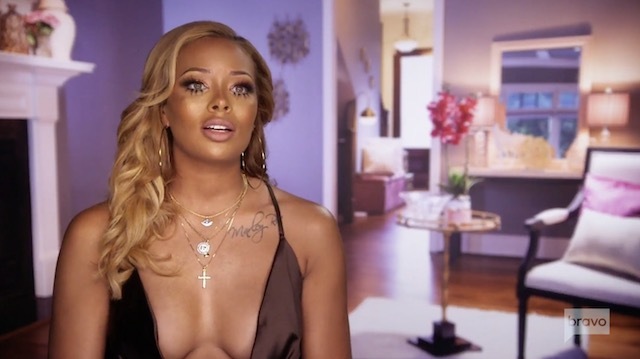 Eva Marcille Gets Married On Tonight's Real Housewives Of Atlanta! While all the ladies manage to show up for Eva’s ceremony not all of them are in celebratory moods! Last week, as I’m sure you noticed, NeNe Leakes was absent. Gone but not forgotten however, as everyone discussed NeNe’s insane outburst during the Bye Wig Party. NeNe manages to make an appearance for Eva’s wedding – which she is in – but hearing Eva’s vows has NeNe Leakes realizing that her marriage to Gregg is in serious trouble. Later she confides in Cynthia Bailey about what’s going on and Cynthia is shocked. Meanwhile some of the other women are, one again, concerned about Shamari DeVoe‘s drinking and outrageous behavior, which has even more people questioning if she has a problem! Then during the reception Porsha Williams and Kandi Burruss decide to confront Marlo Hampton about a miscommunication she caused with NeNe after the Bye Wig Party, which leads to a super escalated conversation about NeNe’s behavior that night and how she treated the other women. All this happening while Eva is supposed to be celebrating the happiest day of life with all that overspending! TELL US – DO YOU THINK NENE DESERVES TO BE CONFRONTED ABOUT HER BEHAVIOR AT THE ‘BYE WIG’ PARTY? NeNe Leakes Says Cynthia Bailey Has Been Sneaky & Truth Will Come Out During Finale!